Ever since Fast and Furious Tokyo Drift came out over a decade ago, the Japanese car culture has been on my radar, always wanted to experience true JDM car culture, Japanese culture its self and the Japanese art of detailing. It all started Thursday morning with a quick 1.5 hour flight to Vancouver from Edmonton, then a long 10 hour flight to Nartia Airport just outside of Tokyo... That was the plan, unfortunately travel delays happen, I missed my connecting flight in Vancouver due to maintenance issues in Edmonton and I was rerouted to Hong Kong on a direct 14 hour flight, then a 6 hour layover in Hong Kong then finally a quick 5 hour flight to Narita airport! Arriving finally Saturday at 6:30 in the morning. No sleep was had on the flight, exhausted to say the least, but extremely excited to arrive. You receive the first taste of the culture once you end up past customs, all the lights, sounds, and food you're about to endure. Then off on a quick train ride to downtown Tokyo! Fast forward to the evening, my guide through this incredible experience was detailing legend Kai Mortia, owner of Kamikaze Collection here in Yokohama, Japan. Our first stop was the very famous Daikoku Futo parking area. It is situated outside of downtown Tokyo, and its quite the site to see. The parking lot is nothing special its self, until all the cars arrive, going around the high rise over passes circling around the parking lot, you can hear the cars coming. It was almost non stop, the endless amount of Skylines, Silvias, and everything else modified with a ton of neon! At this point I knew I was witnessing the true JDM scene and couldn't be happier about it. Below is a first gen Nissan Skyline in immaculate shape, this was by far my favourite car to see. Even though the owner could barely speak English I cannot speak any Japanese, he walked me through the car, showing me the engine bay, interior, and trunk set up. It has been his build for quite some time. Walking through the parking lot you can see and feel the passion behind all the cars. Kai shared stories of the start of his detailing career. When he was young he would polish and detail the JDM cars right here in Daikoku on Friday and Saturday nights! We ended our evening at Tatsumi parking area, where a fair share of the same cars ended up due to the police closing Daikoku parking lot. Upon arrival I was greeted by Chiba Kunihiko, the owner of Chiba Garage. Inside the studio they had 3 cars currently being worked on. I can only share one of these cars as the other car has yet to be worked on and the other is a very rare multi million dollar classic Ferrari. Below is a few of the products they use, including some new products coming from Kamikaze! Below this might look a normal Toyota Celica, well it is. In fact, its one of the lowest original collector status Celicas in the world with less than 3500km on it. This car has quite the history with Chiba, when Chiba started his detailing career, his instructor at the time detailed this exact car 10 years ago. Now he is bringing the car back to life with a full month of treatment!.. YES, thats correct, a full month on a single car. The amount of patience and care Chiba puts into his work is truly a work of art. He is the true definition of a mentor and leader in the detailing industry. His process includes removing pieces of the car and detailing and polishing them to perfection, he told me the pieces you see here have over a day of work put into them. Can you say perfection? 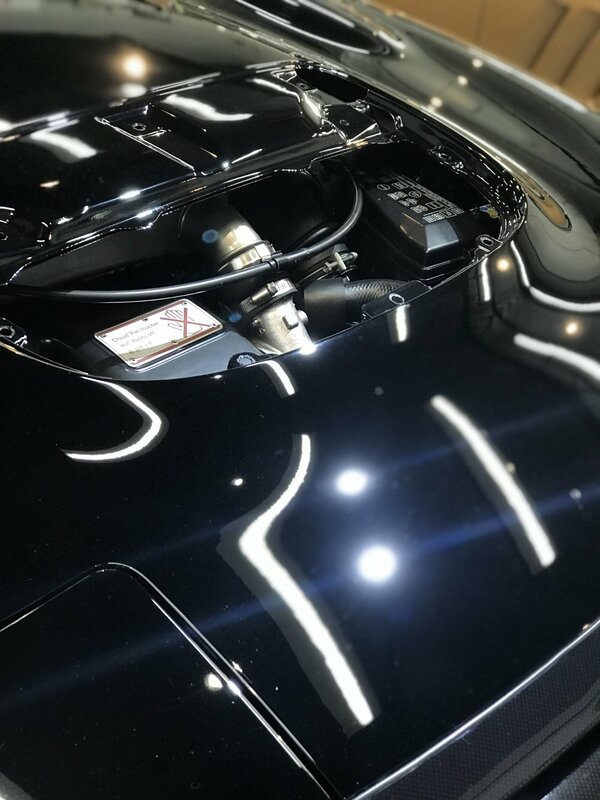 Next, is the engine bay where he shared the tools and his detailing ways to treating the engine to a safe detail and better than new look and feel. Once again over a day of work alone in the engine bay! He also noted he hand paints and repairs faded rare emblems, ensuring a flawless look. Chiba was telling me it still needs the finishing touches and final coating, which will be done within the week. I was speechless at this point, the car was stunning. Look at the insane depth, clarity and gloss in the paintwork! With my brief visit to Chiba Garage, I learned a lot of the Japanese art of detailing and his true professionalism towards the industry. An amazing and humbling experience to see the hard work and extreme patience Chiba and his small team puts into each and every car. I am very proud to be able to visit and learn some of his Japanese techniques to bring with me and my detailing career. A quick back story and my history with the Kamikaze detailing collection. I first heard of the coating through a fellow detailer and friend in Toronto, Michael Luu with Dynamic Detailing. He purchased some Kamikaze and was amazed with the quality and craftsmanship inside the tiny bottles. From there I placed my order for the very boutique products and was amazed of the ease of application, longevity, and insane gloss and depth the products offer. This product was MIYABI coat. From there I knew I had to get my hands on the exclusive coatings that are only available to certified detailers around the globe that receive special training from Kai in order to apply the product properly. So here I am in Japan, training to become a Kamikaze accredited detailer! Extremely excited to say the least. The new Kamikaze headquarters is located in Yokohama. His new location is very new and undergoing construction to be made into a state of art detailing training centre and studio. Kai has tons of proper lighting with all black walls and ceiling to ensure the perfect paint correction environment. Below is a few of the products we will be training with! We begin our training with learning the Kamikaze cutting and polishing techniques! I never thought of different techniques for cutting and polishing as I've used the same old way from the beginning. But with this Kamikaze technique paired with the Kamikaze products I am able to cut quicker while at a lower temperature. Which is amazing to say the least. Note the difference between the left and right side. Absolutely flawless finish. Here, we began the coating application process. Starting with MIYABI coat, and then ZIPANG coat! ZIPANG coat is a new product that offers long lasting protection, insane gloss and depth in the paintwork, this product is only available through application by certified detailers around the world. Below we have segregated sections showing the differences in the paintwork. ZIPANG is on another level of gloss and depth! I can't wait to use this product on some very special projects! Next, we prepared the hood for proper application of ENREI coat and INFINITY wax! INFINITY wax is the only wax on the market that contains coating inside the wax, ensuring a long lasting protection while being very deep and glossy. Summing up the rest of our day with training on the rest of the collection. I am proud to be the first and currently only Canadian to be a certified detailer by Kamikaze. I am extremely excited to offer the entire Kamikaze Collection to my incredible list of clients. Looking forward to sharing my future projects on YouTube, Instagram, and Facebook @PoshDetailing! And I cannot wait to return to Japan to learn even more and visit with all the great people I worked with during my stay. Special thank you to Kai for the one on one training in his new studio and for the guided tour around Japan! Please email eric@poshdetailing.ca with any questions you may have about my visit to Japan or detailing inquiries!